Gatlin, you may recall is the American who won the Olympic 100 metres title in Athens back in 2004, then subsequently failed two drugs tests for testosterone. But, with the help of expensive lawyers, he managed to get shortened bans and came back to become world champion last year, thus helping deprive Usain Bolt of a golden farewell in the event in which the Jamaican is a triple Olympic champion. Now in the next couple of weeks it is boxing’s turn to witness two proven rope-a-dopers profit substantially from engaging in world title combat despite misdemeanours in the pharmaceutical department. A week on Saturday Alexander Povetkin, the Russian who was Olympic champion in 2008, will engage with multi-belted world heavyweight champion Anthony Joshua, who won Olympic gold in London 2012, at Wembley Stadium. Fight-wise he is a dangerous puncher early on but at 39 probably requires those banned PEDs to enhance his suspect stamina. Of more immediate interest is this Saturday’s appearance of Saul ‘Canelo’ Alvarez, who twice tested positive after ingesting an illegal muscle-builder and escaped with a modest six months ban. He now has a much-vaunted reprise with the phenomenal WBC world middleweight champion Gennady Golovkin that will see him collect the thick end of a projected $US80 million gate and pay-per-view bonanza. 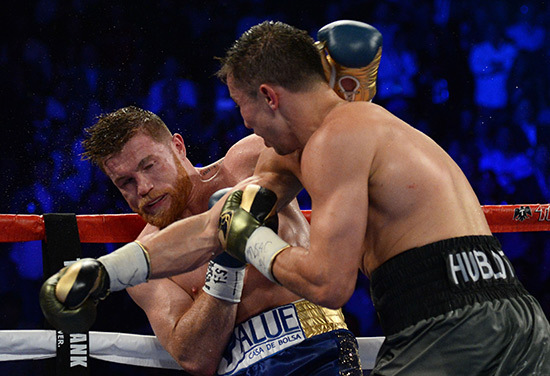 Gennady Gennadyevich Golovkin – hence Triple G – and Canelo (that’s Spanish for cinnamon, the colour of his hair) go to war for a second time a year on from their first encounter, and eight months after the Mexican failed his two drug tests. ‘You can’t deny there was some injection marks,’ Golovkin has said. ‘On his arms there was some injection marks. I don’t know what it was but the injection marks were evidently there; everywhere, his biceps, his stomach, and pretty much everywhere. Alvarez has angrily rejected Golovkin’s accusations, and has promised to knock the champion out in retaliation. The Mexican blamed his positive test for clenbuterol – an asthma medication that can also help build muscle and burn fat – on eating contaminated beef often illegally mixed into livestock feed in Mexico to make meat leaner. And boxers stronger, maybe? Alvarez has lost just once in 52 fights – a points defeat by Floyd Mayweather in September 2013 – while Golovkin has won 38 of his 39 contests. In what has been termed Cain and Abel re-visited one senses a groundswell of opinion towards the eight years younger Mexican and there is a strong argument for his all-round athleticism to prevail in another tight, taut finish. But for me the wily Golovkin still has the edge in mental and physical strength – and tactical nous. He is the fiercest body puncher around, is happy to take one to land two, ands absorbs a good shot without flinching. There is a definite touch of the early Tyson about the one-man wrecking machine they call “the Beast from the East”, in tactics and technique – though thankfully not temperament. In any poll for the current world best pound-for- pounder, I suspect the majority of pundits will go for Vasily Lomachenko or Terence Crawford. But I am sticking with my man Golovkin, the smiling assassin. I love his gumption, aggression and technique. And I want to see him put carnivore Canelo on his backside to prove a point about doping. Alvarez is the finer boxer at long range but even though at 36 every day that passes makes Golovkin a tad slower. I don’t think the Mexican will get close enough long enough to restrain the bigger hitter if the two.